CANADA: Air Transat has been fined C$295,000 ($228,000; £169,000) after passengers had to wait on the tarmac for up to six hours without enough food or water. Canada's Transportation Agency said the airline failed passengers and had not upheld its own terms and conditions. The determination comes after an inquiry into two Air Transat flights delayed in Ottawa last July. Passengers on one flight eventually called emergency services. One told the inquiry they had felt like "luggage". 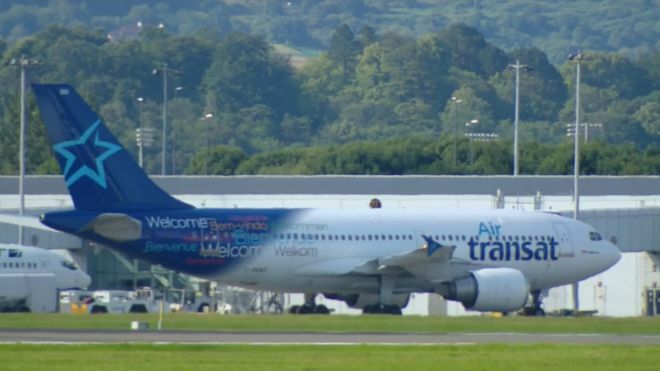 The federal agency said that Air Transat did not properly apply its own terms and conditions of carriage because the pilots did not consider allowing passengers to disembark when the delay exceeded 90 minutes. It also found the air carrier was not relieved of its obligations to passengers simply because of events beyond its control, whether it was the flight diversions due to poor weather or the actions of other parties at the Ottawa airport that contributed to the lengthy delay. Air Transat issued an apology on Thursday and said it would give $500 to each passenger affected by the 31 July delays. The airline added it would take all necessary measures to comply with the transportation agency's directives, including ensuring its staff were adequately trained and amending its policies on tarmac delays. Passengers on 157 from Brussels and 507 from Rome were stranded on the tarmac at the Ottawa airport for up to six hours. The flights were among 20 diverted to Ottawa from Montreal and Toronto because of bad weather. The air carrier said that a factors beyond their control led to the tarmac delays. In August, the Canadian Transportation Agency held a public inquiry into the widely publicised incident. Twenty-nine passengers eventually offered testimony about their experience. They described a growing frustration and panic fuelled by poor communication from airline staff. Passengers said they were stranded without adequate air conditioning, food or water, and working toilets. More than one passenger who testified during the public hearings said that they felt they were seen simply as "luggage".